I would recommend against curbing the appetite – unless it gets in the way of fulfilling his responsibilities (e.g., homework, chores, etc.). Parents and teachers can use a child’s special interest to their advantage in multiple ways. Kids with High-Functioning Autism and Aspergers often display behavior, interests, and activities that are restricted and repetitive and are sometimes abnormally intense or focused. They may stick to inflexible routines, move in stereotyped and repetitive ways, or preoccupy themselves with parts of objects. Pursuit of specific and narrow areas of interest is one of the most striking features of High-Functioning Autism and Aspergers. These children may collect volumes of detailed information on a relatively narrow topic (e.g., dinosaurs, trains, deep fat fryers etc.) without necessarily having genuine understanding of the broader topic (e.g., the youngster might memorize camera model numbers while caring little about photography). This behavior is usually apparent by grade school, typically age 5 or 6. Children with High-Functioning Autism and Aspergers latch onto topics and interests that are often considered a hobby by others. However, they develop an intense interest in the subject and may become experts in it. Some obsessions involve physical collections while others are fact-based. The interest may give them a sense of identity if they are considered to be an expert in the area. The interest is associated with pleasure (e.g., a family trip on a steam train or a visit to a game park). The interest is a form of relaxation. High-Functioning Autism kids thrive on routine, and familiarity and being able to lose themselves in an interest is a stress reliever. High-Functioning Autism kids struggle with the unpredictability of life and social interaction, and feel secure within the confines of their special interest. While special interests can be beneficial to kids on the spectrum, they can also cause difficulties and become a source of annoyance to those in their social circle. Although these special interests may change from time to time, they typically become more unusual and narrowly focused, and often dominate social interaction so much that the entire family may become immersed. Stereotyped and repetitive motor behaviors are also a core part of the diagnosis of High-Functioning Autism and other ASDs (e.g., hand movements, flapping, twisting, complex whole-body movements, etc.). These are typically repeated in longer bursts and look more voluntary or ritualistic than tics, which are usually faster, less rhythmical and less often symmetrical. • Anonymous said... also sharing his interest will help him 2grow. Social skills r a challenge & u can use his interests 2help him communicate better. Conversations w\other ppl r challenges 4them. Use this & anything u can 2help him. • Anonymous said... Becci Snead Ellison, thank you!!! That is a great idea!! She usually interrupts dinner time conversations and this is a great way to teach her!!! I so appreciate your input! • Anonymous said... enjoy him & love him 4who he is! His own unique lil person! He will amaze u! • Anonymous said... enjoy the interest w\him, build a bond w\him now so u can continue 2know him & learn about him. They will bcome strangers if u dont take time 2know them. • Anonymous said... Eventually you can expand to. Where they lived, what they ate, what period etc. art projects can revolve around making dioramas, making plaster casts of 'footprints'. You can add writing by creating a biography page for each species with all the info. Take dinos and run with it. • Anonymous said... Games. It still gives him a connection to his peers but I miss our trips to museums and zoos where he blew everyone away with his knowledge. • Anonymous said... I've always let my son go with what he feels. Yes, there have been times I had enough and had to say we would have to talk about it later. The interests do change over time and as they age. My son is now 15 and isn't as into 1 thing anymore. They feel very isolated as it is. Having an interest and being excited about it is healthy in my opinion. My son has always been so passionate about certain things throughout the years. It gave him confidence and he was proud of his knowledge. • Anonymous said... I've had to limit my daughter's time with her obsession. She loves Super Mario Bros for the Wii. She'll play it, has stuffed characters, watches the old TV show on Netflix from the 80's and will watch Youtube videos of other people playing and tips. I do make her alternate it with her other interests and she's only allowed to play the game in 30 min intervals and never first thing in the morning or right before bed. If I don't she gets hyper and can't focus. She'll also dream about it. She literally talks about Mario in her sleep. • Anonymous said... Just listen Mom , I promise you some day he'll thank you for it! • Anonymous said... Let him be excited to share. And let him know you are proud of his vast knowledge of dinosaurs. Who knows, he could grow up and be the world's greatest archeologist!!!!! • Anonymous said... Let him do dinosaurs now. He'll be just as obsessed about the next thing when it comes along. • Anonymous said... McKenzie, use her love if those subjects to teach her a social skill! You can practice at dinner by giving her an appropriate amount I time to talk about her subject but then giving brother a chance to talk about his day it subject and have your daughter respond with questions or gestures that would be appropriate in any conversation! This is an exercise we learned from ABA and we have fun with it all the time! • Anonymous said... My 13 yr old talks about bustin bieber n one direction all the time. She use to talk about school o much I told her no talking about school after 5pm. It took awhile but it works . Now it's music. • Anonymous said... My ltl man moves to a new topic when hes ready. Thomas the tank was approx 4 years! • Anonymous said... Oh absolutely! I know way more about WWII than most because of my son! This is perfectly typical I our a-typical kiddoes! . • Anonymous said... Our daughter is 12 and she will spend all her energy and time researching and discussing the Titanic, Helen Keller and now it's Ann Frank. It can get overwhelming for us and her brother to listen to this all the time. But when we ask her to talk about something else she feels hurt and says we just don't want to listen to her . Just not sure what to do sometimes. • Anonymous said... Perfectly normal. My 12 year old son is still like that. 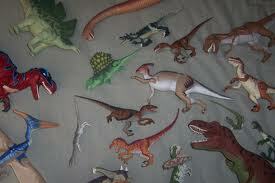 Eventually your son will switch to another subject, and the dinos will disappear in a second flat. Ride the wave. I figure if it makes him happy then I will feed the knowledge to him until he is ready to move on. Because he always does. • Anonymous said... setting limits r good, 10 mins of dinosaurs, then 5 mins on something else...(4example) give & take of relationships r important 2teach him. Limits but not denial or smothering. Teach him thru his interests! U will learn more about him!! • Anonymous said... That is very common! We have a Dino lover expert! Autism Speaks is a wonderful that has helped us. Our son is 6. You will really enjoy all the quirks that they have. • Anonymous said... This is perfectly normal with a child with Asperger's. Be supportive and indulge his curiosity and enthusiasm. Can you use this special interest as a bridge to explore other subjects? Before you know it, his interest in dinosaurs will wane, and he will move on to a new special interest. Also perfectly normal. As for social skills, you may want to coach him that other people may not enjoy talking about dinosaurs as much as he does, but it's OK to like dinosaurs and want to learn all about them. It would be great if he could find a friend who likes dinosaurs as much as he does, so he will feel accepted and have someone who shares his special interest very much. • Anonymous said... We moms of aspies need 2stick 2gether! Even when u hear dinosaurs n ur sleep...remember...this is her world shes sharing w/u! U can teach her more about the world she has 2live n also! hang in there! Its tough but soo worth it! * Anonymous said... Here is an idea that helped us TREMENDOUSLY when our son was severely stuck on topics and could not have a two way conversation. A STOP WATCH! Give the child a stop watch and let him push the timer. He can watch the time tick by or not, but the stop watch does help keep his interest. He has one minute to tell you whatever he wants to talk about. At the end of one minute, the stop watch goes to the parent. The parent then starts the timer and responds back to the child about what he was discussing. (Child cannot talk during this time. He has to listen.) The parent can then change the subject. At the end of one minute, the child gets the stop watch back. He restarts the timer and he has to comment on what the parent just talked about BEFORE he can talk about what he is stuck on. If the one with the timer has nothing more to say and the minute isn't up yet, no one can talk until the time is up. This really helps the child with self-control and stops rattling. This method saved us after my husband passed and there was no one around to listen except my ears. My son quickly learned two way conversations. My family and friends could not get over the fast improvement. Whenever he wanted to talk about what he was stuck on, or something in his day, he would come to me and say, "I have something really important to tell you," as he handed me the stop watch. If ti wasn't the best time, I would ask him to wait 15 minutes (or however long it would be before I was available) then he could talk as long as he wanted with the stop watch. It stopped the all day verbal chattering about nothing. • Anonymous said... Try to help them find lots of mini obsessions It can help breakup the challenge of the same topic all the time. So important to work with the obsessions and not fight them. They can become your communication lifelines in difficult times. • Anonymous said... Absolutely. My son is 7, and he goes on and on about his "topic du jour.". This is where speech and language pragmatics therapy comes in. Learning the back and forth of conversations, etc. • Anonymous said... Great insight!!! Makes me understand my nephew now even better. • Anonymous said... I think it is important to also introduce other things so that they develop in other areas. Some form of physical activity, some other toys, and things that may be related but help introduce something else...for example, fiction books about dinosaurs that lead to fiction books on other topics. Or non-fiction books about reptiles. • Anonymous said... If my son could play Roblox 24-7 he would! That's all he wants to do. • Anonymous said... My grand daughter has a huge obsession with Match Box Cars. We have three Aspies in our family. • Anonymous said... My sons is almost 10 and huge into Pokemon. All I hear most days is about Pokemon. I had to set time limits on how often he can play it but he still talks about it all the time. This is his life log obsession because he's been playing it since he was 2. • Anonymous said... Use his love of dinosaurs to keep him engaged in conversation with you and others. My grandsons will maintain eye contact for longer lengths of time if they are talking about their favorite things. • Anonymous said... Very common with aspies. Both of mine have favorite things they would play with or talk about. • Anonymous said... yes, that is common. or months or years of one or two preferred activities. Even if he shows massive resistance, its important to make him do other things and set limits on the obsessions. • Anonymous said... You can also use his obsessions to teach other skills, adding and subtracting dinosaurs, dinosaurs in a conversation, etc. • Anonymous said... My 16 year old aspie spends hours (not all at once) a day jumping on the trampoline. I think it kinda grounds/comforts him. • Anonymous said... My son did the dinosaur thing... totally normal...I believe we should not discourage them however difficult the repetition becomes... its very difficult to steer them to other interests..
• Anonymous said... My son had a thing for cars when he was younger...don't curb it - it's what they love! it's their focus and it's often what will keep them calm and interactive. Instead, teach through it. We learned colours , maths, imaginative stories ...the list is endless!! • Anonymous said... My son has hyper focus on one subject at a time that can lasts for months...then he moves onto something else! This transition has Improved as he's got older, he changes his focus in quicker turn around times, and at times is interested in more then one thing! He is now 12. He can be super happy about his focus when it's going well...for example he is really into yo yo's right now (hand eye co ordination off the charts) and is learning all the tricks he can!! But his string broke on the yo yo and had a total meltdown! Always have spares!!!! • Anonymous said... My son is 8 years old. We tend not to curb his appetite for his repetitive play. It is something that keeps him happy. What we have done is try to introduce new games. • Anonymous said... No let him go....this is one thing about autistic kids is a specialty. My son is 8 and right now it's minecraft. He is also very interested in dinasours, springboard diving (his sport) space. My biggest piece of advice is don't treat him Any different. We exspect the same behavior from him as our older son (they are 17 mths appart). The only difference is we have more patience and understanding when it comes to our 8 year old. But if he doesn't follow the rules he does get grounded. Usually it's his tablet we take away. We started this when he was young and we are finding it easier now that he is 8. Still have our bad days but they are less. They MUST know where those boundaries are. There is no gray area with my son only black and white, right and wrong. • Anonymous said... Oh and he is also a Minecraft fanatic, I know quite a few asperger kids who love Minecraft. • Anonymous said... We loved the yo yo phase! I use same method with the kids that I work with , it definitely helps to control their chatter. Great idea ! my 15 yrs old high functioning daughter is fixated about people. At the moment she is totally absorbed by a girl friend and the idea that the girl might have other friends other than her is so overwhelming that she might get into a bad spiral of thoughts: like that she cannot live without her girlfriend or that the girlfriend might refuse her. The fixation has brought my daughter to bad episodes that she attemped suicide. Any advise on how to move her out of "people obsession" would be greatly appreciated.